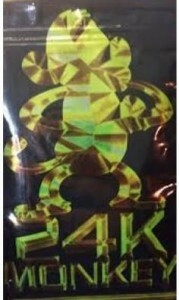 Never having tried or heard of 24 K Monkey before. I was hesitant to grab it in favor of my traditional favorites from an online headshop. After extensive discussion with my friend, I decide to take the proverbial plunge and give 24K Monkey a try–and quite pleased was I. This herb was pitched to me as a “quality incense,” strong yet never overpowering. Strength has never been an issue for me, but neither has occasionally trading out an old favorite for a taste of something new and promising. I have heard that once other people give 24K Monkey a shot, they pretty much ignore the rest of the inventory afterward. To further sway me my friend pops the top off 24K Monkey for a sneak peak and a sniff. The herbs look spectacular, exhibiting a nice appearance as opposed to the “sticks & stems” substance found in other brands. The natural smell is full and robust, hitting nearly all the sweet spots the sense of smell can provide. This incense is one of the smoothest burns I have tried to date, anything but harsh. Self-ascribed to “stimulate the mind and senses,” this can be confirmed as an accurate description of the “intense aromatherapy” 24K Monkey provides. Definitely worth a try for veterans and moderate users alike. monkey see monkey do . get this monkey or you da fool . lol stuff is fluff and hangs real tough the baggie was smaller in size then a 24k monkey I received from a different site a few years back but the bulge was crazy like they compresesed it to make sure they put as much as possible in it .